It seems like only yesterday that a cable TV network had this same film on - and now it is in theatres! No, the TV movie was set in the Bermuda Triangle... With Luke Perry... Olivia D'Abo... Dan Cortese... and a black actor, what was his name? Wait, it's coming to me... The Triangle... late last summer on TBS Superstation... Dorian Harewood! 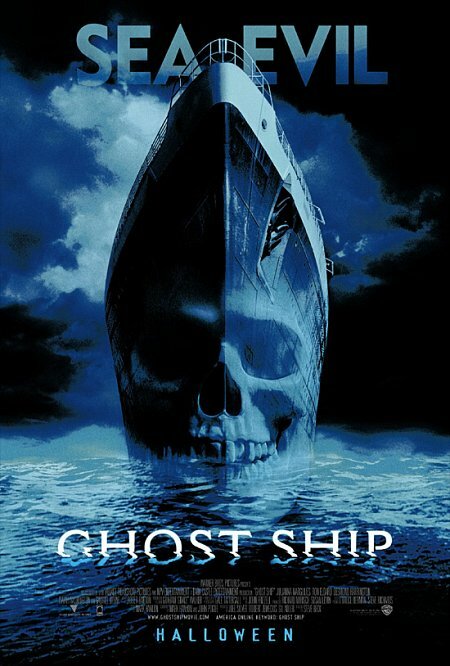 The names have changed and so, too, has the location, but Ghost Ship is pretty much the same underwhelming film. It features a couple of "ER" alums in Julianna Margulies and Ron Eldard, as well as Gabriel Byrne and Isaiah Washington, the accomplished black actor who was quite good in the modern gangster pics Exit Wounds and Romeo Must Die. The four of them are all part of a boat salvage crew lured to a mystery ship in a remote region of the Bering Sea. The humongous vessel turns out to be an Italian passenger liner lost at sea since 1962. The fate of the original passengers is at least partially revealed in a gruesome opening scene, and I do not think I am spoiling too much when I say that it is all so supernatural. This only makes one wonder just how badly these present-day bounty hunters will fare once they board the behemoth. Thir13en Ghosts director Steve Beck returns to the sea where he was so very good as the visual effects art director on The Abyss. Here as this film's director, he is so, so predictable and far less imaginative than James Cameron, whose Abyss and Titanic films are about as good as movies made on water get. Suddenly, it is all getting clearer... This is the evil Titanic... without Rose and Jack (of course). Maybe, this is what would have happened if the Titanic had drifted off into... The Triangle. As the salvagers are offed one-by-one, it is pretty clear that Margulies (seen more recently in the TV miniseries "The Mists of Avalon") will be the last one standing. Ghost Ship is seldom scary. More often, it is just plain creaky. And yet, I think it is a little better than I expected. Then again, I didn't think Waterworld was as bad as everyone else did. I have to wonder, though, did Margulies escape the small screen for this? !